This is the webpage of the Cosmology and Computing group at Kenyon College. We are an active group who are interested in how computation and Precision Cosmology can help us to understand the most fundamental nature of the Universe around us. News! Check out our newest work to appear in PRL on June 24th! Check back soon for all sorts of updates. Maria Huey - Maria is a sophomore physics major at Kenyon College. She is from Cincinnati, Ohio and is in charge of our visualization department, converting our output to HDF5 files, making plots and movies. Sarah Murphree (Maggie) - Maggie is a Senior Physics major from Meadville, Pennsylvania. 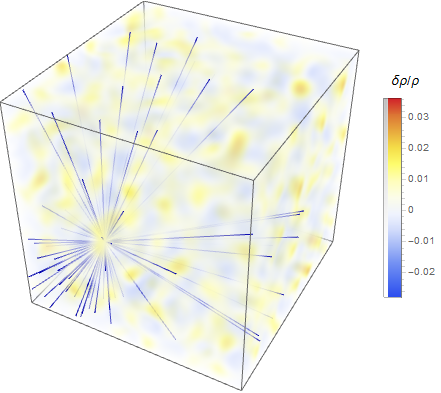 She is working on modeling large-scale structure by simulating the evolution of axion dark matter as a scalar field. This picture uses the Schroedinger-Poisson equation instead of the Klein-Gordon. Gwyneth Phillips - Gwyneth is a Junior at Kenyon College from Wheaton, Illinois. Right now, she is investigating the behavior of dark matter at the galactic scale by using Schrodinger GABE with modified boundary conditions. Rachel Nguyen - Rachel is a Senior at Kenyon College from New Orleans, Louisiana. She is researching the generation of primordial black holes after inflation using a fully relativistic version of GABE. Patrick Shaw - Patrick is a Senior at Kenyon College from Pottstown, Pennsylvania. He is investigating dark energy in axiverse models using CUDA enabled GABE. John T. Giblin, Jr (Tom) - Tom has been at Kenyon Since 2009 and is currently an Associate Professor of Physics. Tom is interested in how numerical methods can help us learn about fundamental physics. His interests are in Cosmology, Particle Physics and Computation. Ann - Ann joined the group in May, 2014. She has 32 processors and 128 GB of RAM; but she's a CUDAmonster with a brand new Tessla K40 with 2880 Cores! Eliza - Eliza just joined our group in June 2015. She is a monster with 256 GB of ram and twenty 3 GHz cores. Jo - Jo has been with the cosmology group since 2009. Although she only has eight 3 Ghz processors, she makes up for it with 196 GB of RAM and 2 TB of 15,000 RPM storage. Gabrielle - Gabrielle is the largest single-node-computer in central Ohio. Her primary allegiance is to the deparment of physics, but she enjoys Cosmological simulations. With 512 GB of RAM and 64 processors (that's right, 512 GB of shared memory) she can do almost anything. Holly - Holly joined the cosmology group in 2012, replacing Holly Emeritus--the founding member. She is a MacPro with 64 GB of RAM and 8 real (16 virtual) processors. She is unparalled in her ability to run code, render phots and play '80's hair band music at the same time. Sabrina - Sabrina is the administrative head of the Cosmological Simulators. She is a MacPro with 12 real-2.66 Ghz cores and 64 GB of RAM. She does what she wants.